Just right for the cold winter season! When the nights are getting longer and colder, and the days shorter, that's the time for a cup of a German hot drink that is called "Mecklenburger Punsch" . This is a classic recipe from the former DDR (East Germany) and is also called "Seelenwaermer" translated as "warming the soul". Its origin is Mecklenburg, hence the name Mecklenburger Punsch. It contains quite some alcohol and if you think this is too strong just add more orange juice or hot water or don't use alcohol at all. But then it is not a Seelenwaermer anymore... Happy Cooking! - Wash 1 orange, dry it and peel the skin very thin like a spiral (without the white part), leave some pieces for decoration. - Juice all lemons and oranges. - Pour the juice into a glass jar, add cognac and orange peels and let it soak for 3 hours. - Make the black tea. - Remove orange peel from the juice. - Add tea, honey and rum. - Bring to the cooking point (not a boil, otherwise all alcohol will be gone). 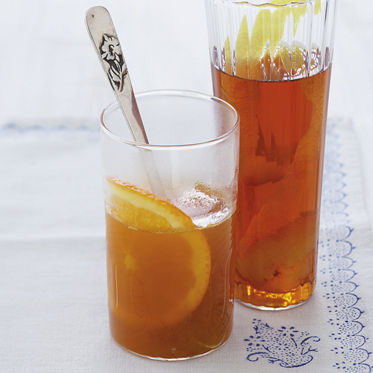 - Serve in special tea glasses with a handle (made out of glass) and decorate with some orange peel.